Yes, people kill people. But guns make a huge difference in how many people get killed. The map itself was part of a scholarly study by researchers from Boston Children’s Hospital and published this March in JAMA Internal Medicine. The map is not without exceptions and outliers, but the general trend is clear: States with more gun regulations had lower rates of gun deaths, and states with less gun laws had higher gun death rates, both in terms of suicide and homicide. That's certaintly not the message we get from the National Rifle Association. In the related study, the strength of gun laws was rated on a scale of 0 to 28. Direct causation could not be determined, but at the very least, such a strong correlation should make it clear that existing public policy in many states with lax gun laws comes at a price of high: more dead mothers, fathers, sons, daughters, brothers, sisters, and others. Now, if you’re going to say, "Well, that’s just ONE study!" To that, I will retort that the Center for American Progress released another study in April that pretty much said the same thing, and that showed that 10 ten states with the weakest gun laws had over twice the rate of gun violence as the 10 states with the strongest gun laws. Also, in 2011, a writer for The Atlantic found, with the help of a colleague, that the presence of gun laws in states had a strong correlation with less gun violence, as the chart and map below also illustrate. Some final food for thought: Building on an earlier Harvard study, a brand new study published in the American Journal of Epidemiology showed that the number one determining factor in gun suicide rates by state was not mental health issues, but gun ownership. 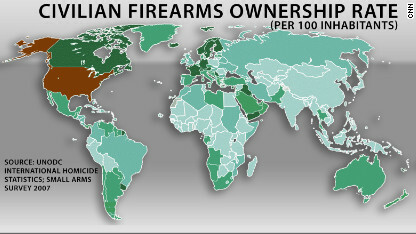 And when it comes to gun ownership rates, well, the U.S. is #1 by far. Leaving the gun laws as they are in many of the highest gun death rate states is akin to pulling the trigger on thousands. Some states are better at this public policy issue than others, and it's time for the laggards to learn from the high performers. If you think I’m wrong, the burden of proof is on you to provide counter-evidence, and not just ideology.